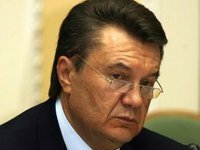 Ukraine's presidency announced on Saturday that President Viktor Yanukovych was currently meeting with three key opposition leaders in seeking a solution to Ukraine's deep political crisis. Batkivschyna said in a statement posted on its website that the meeting had been requested by the All-Ukraine Council of Churches. "All Ukrainian churches have asked us to resume negotiations and blessed our participation in them," Yatseniuk said after the opposition leaders met with council members. He also said clerics were planning to go to the main site of demonstrations to appeal for a peaceful settlement of the conflict. Saturday's talks at the president's office in Kyiv were this week's third meeting between Yanukovych and the opposition leaders. After the first meeting on Wednesday, which lasted more than three hours, the opposition leaders refused to talk to reporters on leaving the president's office, the venue of the talks, while a statement from the office merely described the meeting as "the first round of negotiations." The results of the second meeting on Thursday had a negative reception when the opposition leaders announced them on the main site of demonstrations in Kyiv. The opposition then warned it would step up its protests, and afterward protesters built new barricades and seized the building of the Agrarian Policy Ministry.